When Chris Sarra announced his resignation as co-chair of the Prime Minister’s Indigenous advisory council to concentrate on a new position as the head of Queensland’s Department of Aboriginal and Torres Strait Islander Partnerships, he spoke of a shift in engagement. Previously, Dr Sarra has written scathingly of Noel Pearson’s foray into education. This patronising approach to education is reflected in other policies like welfare-reform programs, alcohol-management programs and income-management programs, all of which have cost many millions of dollars, and seemingly reflect a yearning for the ‘good old days’ of the Aboriginal missions. Elise Klein, from Australian National University’s centre for Aboriginal economic policy research, was also critical of Noel Pearson’s Empowered Communities report produced by an unelected body comprising some leaders of Indigenous organisations. Another self-proclaimed leader and, according to his book, adviser to five Prime Ministers, is the ubiquitous Warren Mundine. 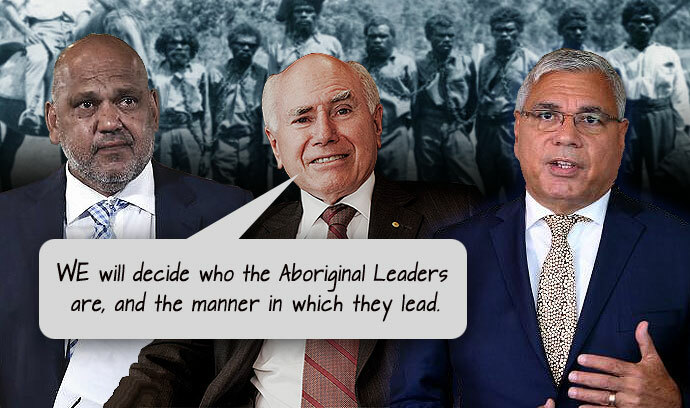 Warren’s CV is really long with an eye-watering array of boards and committees and appointments – the Australian Indigenous Chamber of Commerce, the NSW Local Government Aboriginal Network, the National Native Title Council, the Australian Indigenous Education Foundation, the Indigenous Advisory Committee of the Australian Law Reform Commission, NAISDA and the Redfern Arts & Film Festival Foundation to name but a few. Having endured listening to him speak on countless panels, I cannot for the life of me understand why, from all the articulate, passionate, profound thinkers amongst our Indigenous community, Mundine would be chosen by politicians to advise them on anything at all. And then we have Twiggy Forrest who, for some unknown reason, was commissioned by the government to undertake a Review of Indigenous Training and Employment Programmes. Forrest feels we are wasting money on trying to Close the Gap on Indigenous disadvantage. The solution is simple, apparently. He recommended that the payment of Family Benefits to families, and education funding to states and territories, be contingent on school attendance, with more fines handed out for truancy. Perhaps unsurprisingly, Twiggy is a fan of Direct Instruction too. It seems everyone is an expert when it comes to education. It was also Twiggy’s review that, after extensive consultation with banks and supermarkets, came up with what he called the “Healthy Welfare Card”, now known as the Cashless Welfare Card. You don’t lift people up by smacking them down. Thank you so much for writing this Kaye Lee. I too have been baffled as to why so much faith should be put in the wisdom of Pearson and Mundine when it is clearing lacking. There are many more talented, intelligent and broad minded indigenous Australians than these. As for Twiggy? Well you know? He’s like, rich so he must be like smart yeah? Just like Trump!!! Warren Mundine has been affected by association with people such as Kevin Donnelly, who is critical of the ANU for rejecting the Ramsay Western Civilisation course. Donnelly has been spruiking his Phonics and Direct Action and Only Books education plan for decades. He appeals to some conservative education pundits who hark back to the good old days in the 1950s or earlier. The best thing for the Ramsay club to do would be to approach the Australian Catholic University. Dr Donnelly might be happy to accept the position of Dean of the Ramsay Western Civilisation degree course. Perhaps the Murdoch media team of writers could switch off their bullying of the ANU and set about promoting the good Doctor. The Murdoch team of writers are very keen on the Ramsay idea, as are Mr Abbott and Mr Howard. But I wonder how much these people actually know about such a course which might include Great Books of the Chicago University kind. Mr Mundine has imported Direct Action books from America. Murdoch media is very keen on promoting American politics. Why not import the Chicago Great Books collection? It would be a revelation for these proponents of Western Civilisation. How much do they really know about it and how much have read they widely and deeply into the works of Aeschylus, Herodotus, Plato, Aristotle, Archimedes, Plutarch, Aquinas, Hobbes, Spinoza, Huygens, Berkley, Faraday, Marx and Engels, etc etc. It might be a revelation for them. Dr Donnelly would no doubt be able to help them in an exclusively Australian Catholic University course. There might even be a big revival of the study of Greek and Latin. Now there is progress for you right there. Sorry, tearing my hair out and typing at the same time. Mixed up Mundine and Pearson. Fourth paragraph should read:” …how much have they read widely and deeply…” – a very serious and pertinent question. I feel sick though not surprised by all this- deliberately choosing under performing people? Mind you half our MPs and advisers of any colour are nincompoops as well. Marcia Langton is another person who baffles me, re coal mining… Plus, that education system sounds awful, another example of creeping double colonisation, by the Americans this time. GET RID of these useless people, get sympathetic MPs and other intelligent and good people to call for experts of YOUR choice; what use are millionaires anyway? Forrest I learn employs indigenous people at lower levels yet they complain of a ceiling that exists just for them. I feel such shame though I was not even born here. Because we know that those companies always have the best interests of the community at heart and are so well-placed to advise on how they can get a compulsory slice of the deal. Warren Mundine was awarded Doctor of the University (honoris causa) by Southern Cross University. Perhaps they could ask the Ramsay Foundation for the donation and offer the good Doctor a post teaching the wonders of Western Civilisation. Now THAT might be interesting though I suspect we would just hear whatever his father-in-law, Gerard Henderson, thought on the matter. You don’t lift people up by smacking them down. Could we please have this turned into a plane load of flyers and dropped on Parliament? Re Mundine, I had a run-in with him on his Fb page a few years ago and he threw a huge tanty when I questioned his qualifications for a particular job he reckoned he was expert in. He deleted our conversation and me, off his page. Re Twiggy and his hand in politics. We’ve never voted for him but he has had enormous power and control over this government, detrimentally for the people. Hopefully, he won’t have the same power over a Labor government, not that that’s a foregone conclusion. Chris Sara has been talking smart and actually achieving well with and for Aboriginal people for decades. It’s just the show-pony for the white-man gene that’s missing. With it, he would have achieved about 1/10 as much. Guest, on Murdoch, “Here is a man whose life and actions the world has condemned, yet whose enormous fortune has already brought him acquittal”, (Cicero). He treats Australia like the proverbial family farm and demand that his journos follow his edict and anybody who has the temerity to step outside the family farm gate will be frog marched off. As for the gravy train, would say probably more like the dandruff issue, just as you thought you got rid of it and up right back it’s there again. Not sure that Sarra hasn’t been part of the gravy train himself. The analysis of school level attendance from 2008–2011, school-level NAPLAN gain scores from 2008–2011, and cohort-level NAPLAN gain scores from 2009–2010 show no evidence of positive SSLC [Stronger Smarter Learning Communities Project] effects. Be interesting to see how long he stays. An Education Queensland Review of Cherbourg in 2002 showed considerable improvements in attendance (50% in 1997 to 95% in 2002), as well as improvements in literacy in numeracy. When Sarra left as principal in 2005, the principal who replaced him did not share his vision, and Sarra spent a frustrating seven years on the sidelines, watching the school gradually slide with falling attendance and student results. However, in 2011 he was welcomed back to the school by the new principal who had re-adopted the Stronger Smarter Philosophy and was seeing the school starting to pick up again. According to an evaluation conducted for the then Department of Education, Employment and Workplace Relations (DEEWR) in 2013, the major premise of the Stronger Smarter approach is that schools should establish a baseline environment which explicitly names, recognises and displays elements and messages about and from Indigenous identities, cultures and communities. Schools that have participated in the Stronger Smarter program tend to exhibit higher levels of both Indigenous staffing and leadership and community engagement and involvement in school governance, which have been strongly linked with evidence on improving Indigenous educational outcomes. The DEEWR evaluation found that Stronger Smarter schools are successful in reshaping school cultures to reflect a positive sense of cultural identity. I think this is a prime example of NAPLAN not being particularly useful. I would also point out that Alan Luke has trained in and taught Direct Instruction. KL, let me assure you Alan Luke is not a supporter of what Pearson is/was doing in the Cape. In my opinion, while explicit instruction in its various forms is a necessary part of an effective school‐level response – direct instruction is not and by definition cannot be seen as a universal or total curriculum solution. Luke was involved in DI nearly 50 years ago. He has moved on. Teaching will always involve some direct instruction – I used to call it the housework. But it is also important to instil curiosity and a love for learning. It’s important to make school a safe place where trying is encouraged. It’s important to teach resilience and perseverance. It’s important to teach/practice mutual respect and shared responsibility. It’s important to give them the tools to explore, to solve problems, to collaborate and communicate. And it is crucially important to understand that we are all different and that is ok. We learn differently so variety is important. We have different abilities, strengths and weaknesses, and are all at different stages, so personal improvement should be the aim, not comparisons with some spurious ‘average’. Learning should be seen as a lifetime pursuit, not geared to some exam on a certain day. Which is why I hate NAPLAN. It’s like measuring the well-being of society purely by the country’s GDP. If the home environment adds challenges, then the school needs to do what they can to involve the wider community, which is one thing Sarra seems to have had some success with. Direct Instruction is the best way to teach children how to ride a bike. You tell them what they need to do to stay upright, then you give them a multiple choice test on bicycle riding, then you give the ones who get more than fifty percent a certificate telling them that they can ride. It’s the best way. Not only that, it saves money because there’s no need for actual bikes in the course! Isn’t that a proven method of teaching Economics? Both Pearson and Mundine are good old fashioned Uncle Toms, they have spent their whole lives pleading and scheming to be accepted by the white man and his ideals and society.The Indigenous people deserve much much better then these two social political climbers to fight for their well deserved and a long time coming rights.! I cant stand either of the bullshitting dinengenuous bastards, they should both retire to their respective Cabins! Those that ‘fail’ should be sent to remedial bike reading classes where they copy out the road rules 100 times whilst standing on one leg to learn about the importance of balance. That’s what we need. More discipline like the good old days when we measured the mettle of students by how many cuts they could take without pulling their hand away. As I’ve said before, Economcis is where people are paid large amounts to explain why their predictions were wrong. It differs from racehorse tipping in that everyone expects the tipster to be wrong and therefore they need no formal qualification in post hock explanation! Say what you like, I certainly think that would reduce behaviour problems, not to mention lowering class sizes. Love your “how to learn to ride a bike’ lesson…. I had to learn the skill on Dad’s bike, an old men’s bike with the bar… the lesson ended up in the ditch full of nettles. Mum had a new ladies bike, it was seen as too good for lessons. Kaye Lee, you must have been a very good teacher. I am not good at many things but I like to think I made some contribution in my time as a maths teacher. I, like many others, often found the system frustrating when bureaucrats came up with their ideas. We teach individuals and we need the flexibility to do that in the best way we can for each individual. Children should not be constrained by what the teacher tells them – they should be empowered and equipped to go beyond what I say in a classroom. Equipped not only with knowledge but with emotional intelligence. “Uni Left silences western canon”. So says Greg Sheridan in the Murdoch media. There we have it: the end of Western Civilisation. And it was the Left wot done it. Is that not pathetic? The Great Western Canon brought down by the ANU rejection of a degree program promoted by those great pundits of Western Civilisation, JW Howard and T Abbott. And also promoted by that intellectual epitome of Western Civilisation, the Murdoch media. It seems to me that the best thing for the advocates to do would be to take their proposal to the Australian Catholic University where the Canon could be nurtured by that great promoter of Western Civilisation, Dr Kevin Donnelly. No doubt other great pundits would flock in support. But somehow I do not think that will happen. The proponents are looking to make a big cuckoo nest in the number one university in Oz. That is, it wants an EXCLUSIVE site which will put those Lefties to rest, green with envy at the Right-wing rescue of education in this country. No more Lefties taking the long march through the corridors of learning. And with the ABC gone as well, the Right will take over the universe and fake news will be no more. Kaye Lee, you are too modest. Some say you are a multiskilling miracle. Very informative , thank you. Your knowledge and researching skill never ceases to amaze me. I admit to not being impressed by both Mundine or Pearson, I put it down to my inner prejudices, and so suppressed it, perhaps though it’s because they never came across as sincere. I know nothing of educating children or adults, but I do believe that education is more about gaining the skills to analyse, objective evidence, and to be critical untill you are satisfied that the knowledge you gain has truth! Sorry I am not a university graduate and certainly not as articulate as you, so I trust you will I know what I mean! University certainly helps in giving you some skills but I have learned far far far far more since I left. I graduated because I passed some exams, not because I was necessarily going to make a good teacher. That took decades of experience, many mistakes and a lot of advice and trial and error and growth. And I am still learning new things and thinking how stuff could be done better or how I can improve. I completely agree with you about gaining the skills for critical thinking and analysis – now more than ever as we are bombarded with so much that isn’t true. I would add fostering creativity and initiative and communication skills. Working as a team and, for some, how to lead and get the best from their team. I guess surviving 30 years at the chalk board gives me the qualifications to comment on education policy of others. NAPLAN is a fraud designed to keep its promoters in the manner to which they wish to remain accustomed at public expense. I doubt that you can be academically successful without rote learning your Maths tables. re Mundine; check out the proposals to re-develop The Block at Redfern NSW. I disagree. We have calculators and computers that see to that for us now. For those where it comes easy, good. If it doesn’t come easy, I would much rather they understand what they are doing than just learn things off by heart. It will become more familiar through usage. I had a low year 8 Maths class one year. One question on the test was 9×8, A student had drawn nine strokes eight times and then counted them. I could have just said the answer is 72, learn it. Instead, i congratulated her for her lateral thinking. It turned into a whole lesson about others ways to approach a problem, about divisibility tests and the fact that the digits in a multiple of 9 will always add up to 9. Then we do the fun part where you put your two hands palm down and if you want say 3×9, count from the left and put the third finger down. The answer will be given by the number of standing fingers on the left and the number of fingers on the right (27). We then looked at divisibility tests for other numbers. And then the trick for multiplying a 2 digit number by 11 where you write down the two digits with their sum in the middle (carrying if you need to). eg 34×11 .. write the 3 and the 4 and put their sum (7) in between 34×11=374. We were also able to talk about exam technique and how her method, whilst being absolutely valid and gave her the right answer, took too long. Is there a better way? Then we talked about adding 9+9+9+…. We looked at the pattern of what happens to the digits in the multiples. We got around to doing 10×8 -1×8. So many things to discuss about 9×8….. I don’t believe that either Noel Pearson or Chris Sarra’s efforts at education reform and practice have been given thorough and fair evaluations by non-partisan researchers. Both of them seem to have much to commend them, even though their approaches are in some respects radically different. I don’t think that it is appropriate for partisan advocacy by people not properly informed about the motivations, methodologies or achievements of either of these men to be pontificating about their alleged deficiencies. I would like to know who Mundine and Pearson are leaders of. Staff and community members believed that the school must take a balanced approach to the use of teaching practices within the school, and that DI should be one, but not the only, approach incorporated into the teaching practices at Aurukun school. It is clear that there are challenges associated with the implementation of the school’s 5C — Class, Culture, Childhood, Club and Community — education model. These include poor student attendance; a narrow curriculum, focused on literacy and numeracy, delivered through DI during school hours; and the voluntary nature of the Club and Culture component. This has resulted in the Australian Curriculum not being taught consistently. CYAAA has recently adopted the GGSA implementation model called Direct Instruction – 8 Cycles of School Practice. GGSA describes it as ‘a compendium of practices that provide the information and guidance a school needs to support their DI and Positive Behavioural Interventions and Supports (PBIS) implementation’. The review found that, at this stage, the teachers and community members were unable to articulate an understanding of this new approach. 1. I taught at Queenscliff High School, Victoria in the early 1980s. On the staff at the time was Kevin Donnelly (Pre-Dr Donnally). His character was set then. I see that he is still just as obnoxious as he was 30+years ago. Sadly, through the Catholic seepage, he found the ear of Tony Abbott and was appointed to various education panels. EVERYTHING I have read of his I disagree with!!! 2. During my time in the UK I had taught ‘for the SATs’ SAT = Standard Assessment Test. Returning to Australia I found my Aussie school colleagues in a tizz about NAPLAN. “What is this NAPLAN?” I asked. They brought out the previous year’s exam papers. I was shocked. This was Queensland where High School started in Year 8, so we were only concerned with Year 9 NAPLAN. (Maths). The lay-out of the papers was identical to the SATs. I believe that the committee set up to oversee these tests did not bother to check whether the questions related to the Australian Curriculum, but simply took the SATs ‘off the shelf’ changed the pound sign to the dollar sign, decided that was good enough. NAPLAN has been touted as a method of discovering weaknesses and giving teachers the ability to fix them. However, this is not so. The test are conducted in first or second week in May and the results do not arrive at schools until September/October, when only a few weeks are left of the school year. Not enough time to analyse each students results, find the weaknesses and devise an individual plan for each student. Thanks for your insights amethyst3009. Hi, Kevin Donnelly here – it was my late brother Gordon Donnelly who taught at Queenscliff High, I taught at Merrilands High at that time. I sought the dismissal of Mr Mundine after finding his claimed Bundjalung Nation to be a white mans fabrication, the PMs IAC, Ministers and government have deceived Malcolm Turnbull and the conspiracy to hide the failures of aboriginal affairs and native title extends to the PMs own department. All the money has been wasted on fake aboriginal nations, just what white linguists called the language and the country is so stupid it is not even aware.